The email arrives 30 days prior to my trip. I’ve received this email before, as this is my third trip to the Ranch, and I’m hoping that this time perhaps, just perhaps, it will say we can now have coffee. How can I go for one week without my beloved morning lattes? During desperate times like this, I resort to hiding the Nespresso machine so there are no temptations in the am hours. Thus begins my preparation for my 7 days at The Ranch. Follow along with Nicole Mestanas (see her Galapagos itinerary here) as she describes a typical day at the Ranch at Live Oak, a luxury boot camp in Malibu where guests check in for an intensive hiking retreat. Can’t get away for a whole week? 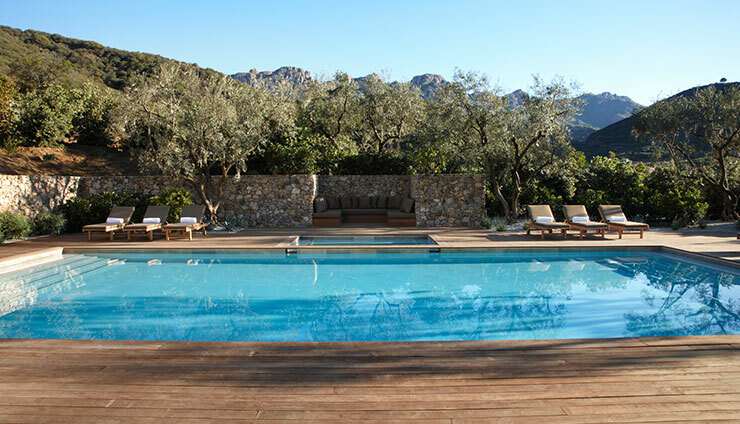 The Ranch offers a 4 day program from Thursday to Monday at the Four Seasons Westlake Village called R.40. Just like being at the Ranch, guests participate in 8 hours of strenuous hiking and exercise per day and eat organic, seasonal vegetarian fare. Low Down: Located in the Santa Monica Mountains, The Ranch at Live Oak is a beautiful compound that beckons the stressed-out, the flabby, or anyone looking to simply recharge. It is not easy and some days are more difficult than others; I was thrilled to get past “toxic Tuesday” without incident. Why would you do this, you ask? Can one not find a way to make subtle health changes in our everyday lives on our own? Yet, a week at the Ranch is more than just detoxing and losing a few pounds--it’s more, much more than that. Stay: The Ranch has a rustic yet sophisticated feel. The rooms are well appointed and serene. And for those of you who have been to the Ashram—here, rooms are all private: no sharing and all with private bathrooms. I find it a wonderful privilege to relax in this space, a place for nothing but my tired thoughts. It’s a much-needed break from Wi-Fi and TV, with no niggling pings, rings or pressing news that can interfere with my solace. This is what The Ranch is all about...for me. I love the feeling of being unreachable, that those things at home can, indeed, wait. Meals are at a communal table that lends itself to convivial banter with fellow guests. It is always fun to see such different personalities commune as strangers at the beginning united only in the same healthy pursuit. As the week progresses, the group morphs into a team and everyone encourages one another through the grueling hikes. The staff is unbelievable. They are courteous, kind, cheerful, knowledgeable and fun. They wrap blistered feet and meet all needs with a smile. There is no request too ridiculous. Eat: The food is amazing, really. Chef Nina is a genius and her riffs on popular dishes offer wholesome, hearty and delicious plant-based alternatives that please everyone. Breakfasts alternate between a smoothie and house made granola. (Be sure to order some granola to take back to the real world.) One morning there is delicious oatmeal served with plump berries and cashew milk, another day the most divine coconut yogurt. Lunch and dinner offer other surprises… vegan lasagna, a burrito bowl with endive scoops, vegan tacos, pad thai and a veggie burger to name some dishes. Chef Nina’s love comes through in her cooking and she is thrilled to bestow her knowledge upon guests. She talks eloquently about nutrient rich and thermo-genic foods and tries valiantly to steer us away from calorie counting. 5: 30am: Awaken to subtle chimes of our trusty guide coming to usher us out of ourslumber to embrace another busy day at The Ranch. 6:00am: Group stretch in the Yoga Room…. I can see Jupiter in the lingering night-time sky…magical! 6:30am: Breakfast, followed by filling up your camelbacks, wrapping blisters—all the fun stuff getting ready to hike. 7:15am: And we’re off, into the van for a quick drive to our hike for the day. “Toxic Tuesday’s” walk is one of my favorites. It begins with a sustained incline for about 90 minutes, starting ocean-side and switch-backing way up the mountain. Then, without warning, the path opens up to a large field. It takes my breath away or perhaps I am just out of breath! The walk ends at the beach with a picnic lunch. 1:00pm: Arrive back at The Ranch and rest one hour before classes and massages start. Post-hike massage therapy is a daily must, you really need it to keep going, and I have never had more knowing therapists work on my tired muscles. Massages take place from 2pm to 6pm with classes in between. 3-5pm: Upper body and core workout in the exercise room or a pool workout. Renewed: After 7 days at The Ranch, I arrive home a few pounds leaner, lighter and with glowing skin. I feel amazing, and my husband keeps telling me how great my skin looks. I am happy to report that the Nespresso machine and I have been happily reunited…..Almond Milk, of course, and no sugar.